"Bang! You Missed!" This game never gets boring for me… even if I'm killed off. I didn't win a single time until about my fifth or sixth time playing, but I still loved the game. First of all, anyone who is interested in a little combative excitement should check out this game. I love combat related games. I wasn't sure at first that I'd be able to get into the Western theme of things since I didn't get into Western movies much. (Maybe I just didn't watch the right ones as a kid. I recently watch an old Clint Eastwood movie and it was pretty cool.) For less than $8 though you can't beat the price for the amount of fun. 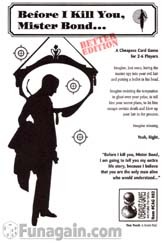 Each player has a specific character and role, which are on two separate cards. There are about 16 different characters and 4 different roles. This is great for replay value because the characters give special abilities (like having better vision or the ability to shoot multiple times in a turn) and the roles give special goals (like "Kill all the Outlaw" or "Be the last man standing".) 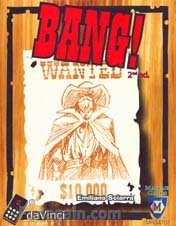 One game you might have Slab The Killer (one of the most feared at our table) as an Outlaw, ready to take down Paul Regret - a weak Sheriff, but the next game, the tide could turn and Slab The Killer is now the Sheriff… or maybe he doesn't show up at all. There is always lots of action in the game; bullets fly, dynamite blows up (sometimes in your hand before you can throw it), horses and barrels come and go. Sometimes players will get stuck in jail, causing the player to lose a turn. Indians and Gatlin guns can hurt a group of people, so you'd better be prepared for the worst. If you do get hurt in a shootout, limp into the Saloon and have a few drinks to feel better. Maybe someone else will even buy you a round. This is practically a MUST-HAVE game in my opinion, but if possible, I'd definitely suggest playing with five or more players. Four players still make a fun game, but the range is a little short to make many of the better weapons really better. One other suggestion, if you do play with 4 players, either take out the 3-bullet characters or bump them up to 4 bullets. With 5 or more players these two characters seem ok, but with only 4 at the table they don't really have a strong enough special ability to make up for their lack of a bullet. The game components are good quality. There is a large 3-peice game board that is very sturdy. Several polyhedral dice, similar to what you'd have for D&D and some other more complicated game systems. The miniatures are well made and even though the stickers aren't perfect I'd say the miniatures look better than what I've seen in some Mage Knight sets. Game play has random elements but not too much to throw out strategy. Of course you could get lucky and blast past the opposing line if you get the right roll and they are set up in bad positions. Each of the "Players" on your team has an appropriate die to roll for movement and tackles. (Despite being based on Football, there is no set Quarterback. For that matter, there aren't any downs, penalties, or time-outs.) When you are ready to move your player you roll that die. If you are in position to tackle, you roll the same die. The odds are different though because normally you want to roll high for running and low for tackles. If you have a "Running Back" with a 20-sided die, you'll have good odds of getting a good number for movement, but not so great on tackling compared to a tackle using a 6-sided die. I can't really think of anything I don't like about the game. I'm sure that it probably won't appeal to people not into sports or games that use dice for random elements, but I like both. The American Civil War game for two players. I think this is a great game if you are looking for a simple but fun war game. There are 4 different types of figures - Infantry, Cavalry, Artillery, and Generals. I'd say that a Cavalry unit with a General make the best unit, although all units seem very balanced. 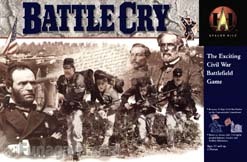 Players are put into the role of Generals and other Officers that had an influence on specific battles throughout the Civil War. In each scenario the board is set up to represent the location of the battle with hills, forests, buildings and more. Each player has a hand of approx. 5 cards which determine which commands can be given in a turn. The board is divided into three sections - Left Flank, Center, and Right Flank.These sections are refered to on the Command Cards. If a player has the appropriate card he may move his units into position to attack. Attacks are determined by rolling special dice and the closer to the target that you are, the more dice you get to roll. The object of the game is to collect 6 of your opponents flags, by destroying enemy units. Personally I really like how the manual includes some history for the war and for each scenario. It helps to set the theme in place. I also think that the chaos factor of the game was set up very well in that you have cards that you can choose how to move but don't alway get the cards that you'd like to. (I've even used this as a variant idea for Battle Masters, which I should be trying out soon.) This forces you to think out alternate strategies. Another thing that I like is "Retreating" - you can eliminate enemy units from the board without killing them. Although this doesn't get you the flags that you need to win, it can help because obviously this will limit what your opponent can do. All in all I think this is a great game for those looking for a short, entertaining war game. Much better than Risk and Axis & Allies. Of course the limitation is that there can only be two players - for that I prefer Conquest of the Empire. "From the Makers of Hero Quest" and "The Epic Game of Fantasy Battles" are phrases that first got me interested in this game. The massive game board, 4 1/2 x 5 feet, also sounded interesting, until finding out how difficult it is to move pieces around. When I finally got the game and was able to play it, I felt that the game just didn't deliver what I would have expected. It is supposed to be somewhat of a fantasy wargame, but there isn't much of a wargame strategy to it. Units move according to a card that is drawn, so you never know when your unit is going to get a chance to move and/or attack. Each team has a special unit which has its own rules of movement and combat: The Imperial army has the Cannon, which can destroy any unit that it hits in a single attack. However, the downside to this weapon is that you may also destroy your own units, even the Cannon itself. The Chaos army has the Ogre, which not only can take double the damage of any other unit on the battlefield, but it may also make up to three attacks in one turn. The down side to this creature is that if you are even one space away from an enemy unit at the beginning of your turn, you might not get even one chance to attack. In the end, with the Chaos army being the larger of the two forces, it can easily be the winner if the Cannon is taken out. With the determining factor being a deck of cards which determines the active unit, the game seems to be a game of very little skill. I can't say I'm too impressed playing this game with the standard rules. This is a game of starfighter combat, from FASA - not to be confused with a game from Parker Brothers also bearing the Battlestar Galactica name. 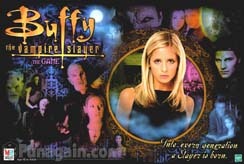 This game puts the players in control of the Human Vipers or the Cylon Raiders, based on the TV show of the same name. As fighter pilots, you battle to destroy the opposition in a dogfight. By secretly determining your actions and simultaniously moving your starfighter(s), the action is very random, much as I would imagine a true dogfight to be. Choosing your next postion is crucial, since you want end up in a position to fire upon an opponent without allowing them the same opportunity. In a large campaign battle, the base ship may also be used, which brings in even more fire power from the base(s). In these battles, players also attempt to destroy the base of the opponent. Overall, this is a fun game, which also allows for continuing competition through tracking ranks and improvements of elite pilots, something with also carried into BattleTech. Review by: Nathaniel Dragon - See BattleTechnical for my photos, variant rules, and other customizations. A game of armored combat from FASA. The first edition of this game came out nearly 10 years before I started playing, but I original got this game because I was so interested in the style of an older game from FASA - Battlestar Galactica (seen above). It is somewhat similar to their Battlestar Galactica game, but it is much more detailed and much more exciting. With the BattleTech 3rd Edition boxed set you get 2 paper map boards and several plastic 'Mechs, but metal miniatures are available at many hobby shops. 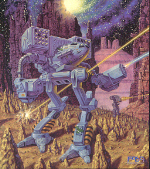 The game is set in the future where warriors fight in huge armored robots, called Mechs, going across hills and valleys, through deserts and even underwater. The Mechs can be configured to carry many different weapons and equipment, such as rocket launchers, lasers, machine guns, and jump jets (which allow the Mechs to "jump" into the air). One of the many factors that make this game fun is the option to design your own mechs and pit them against other custom designs. This game also allows for continued campaigns with improving abilities of the Mech pilots. Players can also add to the game by getting the CityTech boxed set, the BattleTech Compendium, or the BattleTech Master Rules for instructions on urban combat, infantry and other vehicles, and improved technology. The game has also become well known for its role-playing side, which is mostly developed with the MechWarrior Role-Playing Game. The MechWarrior series is currently on its 3rd edition, and although I haven't played it, I have heard that is was written much better than the 2nd edition rulebook. In MechWarrior the players are focusing more on the individual 'Mech drivers, technicians, and others characters that make up the BattleTech world. My personal preference is more in the standard BattleTech game without using MechWarrior rules. There is still plenty of roleplaying that can be involved (if needed) and BattleTech rules still allow players to improve the skills of their warriors. To see more on what my friends and I are doing with BattleTech, check out BattleTechnical. 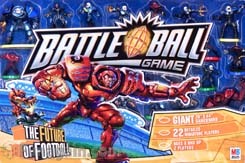 BattleTech in the form seen here is now known as "Classic BattleTech". New products are being published by FanPro. FASA is no more. Recently MGM forced this little "spy" game off the market. Before I lost the chance, I got a copy of the Better Edition for myself. I've never played the original version before, but I have heard that the minor changes to the game greatly improve it. First of all, the game is packaged in the new Cheapass Games cardboard box, instead of the old envelopes. Once I opened the box I also noticed that the cards are more sturdy than the ones that I got with many other Cheapass Games, such as Kill Doctor Lucky and Parts Unknown. The rules seemed odd at first as 3 of us pondered why we would want to send Spies to other players Lairs, until we realized that they can destroy them. I don't know how we missed that in the rules, as they really aren't that difficult. Our first game ended with the winner having only 8 points! No one could keep a Lair. Eventually we've figured out the game and had one time where my friend Rick got over 60 points in one turn - and with 33 points being all that is needed for the win, it wasn't hard to see that he was the winner. Personally, I really like the game. If you haven't tried it using the Better Edition rules, you should. If you have the original game you can modify the game slightly with what you have by changing 2 Spies into Bombs (acting like unlimited strength spies) and playing Lair cards face down. The World's Fastest Card Game! Brawl takes only a few minutes to learn and less than that to play a game! When I read the instructions of this fast-paced fighting game I thought it was amazing how simple it was, but its one of these games that can still give you an opportunity for strategy. All you need to play this game is one character deck for each player. Right now there are 15 characters now in 3 sets out by Cheapass Games - The Original Cast (aka Basic Set), Club Foglio, and Catfight. There is also a Shadowfist set in consideration. The game plays somewhat like games of War and Speed, except this little fighting game is much more intense and fun than those ever were. Each player has a character deck, and each character deck has a special amount of each type of card - Hits, Hit-2's, Blocks, Presses (which cancel Blocks), Bases, and Clears (which remove Bases from play). This determines the fighting style of each character. Hale, Chris, Bennett, and Pearl are 4 of the original characters which I got recently. Hale and Chris have an EASY rating, which only means they are straight up on technique and the easiest to catch on to the best methods of play. Bennett and Pearl have ADVANCED ratings, so they take a little more to catch onto. I'd have to say that out of my current decks, Pearl is my favorite. Brawl is playable by 2 or more players, but I've found that it's most fun with only one opponent. The multi-player version is played in a circle, with each player fighting to the left and to the right. There is also a tag team variation that is explained on the Cheapass Games website, but I haven't tried that variant. Overall I think that its a great little filler and I take my Brawl decks everywhere with me since it's easily stored in small pocket on my CD case. Its a great board game. If you are a huge fan of the series, then you will love this board game. You really get in to it. Takes as long as MONOPOLY, but is more fun to play. Sometimes it takes longer. I started to play with friends at about 6:00 PM and lasted till 5:00 AM. Time does fly when your are playing. 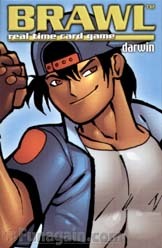 Playing Oz's character is cool because he changes from werewolf back to him self. If two people play one person controls the forces of evil and the other person controls the good guys. It's fun and interesting to play. The game is a best alternative to video games.